Loseable Paradises: if you can’t sequence it, hypertext it! I spent a lot of time in South Wales on outdoor education courses when I was working at Gosford Hill School in the 80s and 90s. 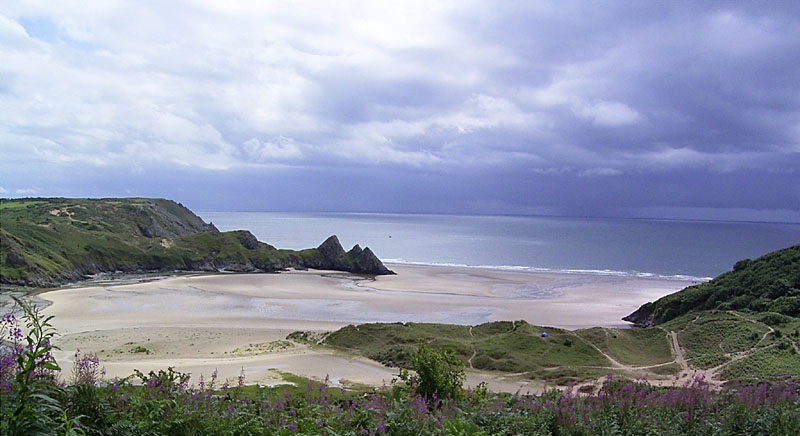 The centre we used to stay at was on the Gower Peninsula, and I came to know it well, and to love its beautiful, varied landscape. We walked the hills, climbed the cliffs, and paddled round the coast in canoes; we even donned caving gear and grovelled our way into its secret interior. It seemed to me to be a magical place, and I wanted to write about it. I also wanted to continue the story of Cyn and Buzz (as I mentioned in the my last post) so it made sense for them to make their way from Oxford to Wales and end up stripped to their knickers on a beach in Gower, running “laughing into the sunlit surfeet splashing…” (That word “surfeet” isn’t a typo, of course- it’s surf + feet = surfeit; a surfeit of sunlight, of splashing.) But I suppose the desire to explore my feelings about the landscape was stronger than my desire to tell their story. As Russ Hoban had pointed out (previous post) I was still more interested in my own technique than in telling a story which a reader might be able to enjoy; but that’s enough self-flagellation for now! The next post will be about Welsh magic and Dragon Girls, and unsuitable for those of a nervous disposition… you have been warned!